If you are in health care, chance are you have come across the essay "How Doctors Die" by Dr. Ken Murray. * If you have not, then you should go read it, because the anecdote likely will resonate if you are an advocate for hospice and palliative care. Essentially, the key point is physicians see so much suffering from unhelpful medical treatments near the end of life for patients, that when a physician encounters a life-limiting illness, they will often forego minimally beneficial treatments. It makes sense right? As a palliative care doctor, I could imagine myself following a similar path, but what does the research show? Are doctors really in lockstep on this issue? Reflecting on this issue and what I have seen in my peers, everyone seems to agree with this essay when they send it to me, but is that just a confirmation bias? Thankfully more information is emerging to help test this anecdote with data. This week in JAMA, two research letters examine the locations of death and the intensity of end-of-life care for physicians compared to the general public. In the "Association of occupation as a physician with likelihood of dying in a hospital," Blecker et al, used the National Longitudinal Mortality Study (based on US Census records) to examine nearly 500,000 decedents from 1979 to 2011. The outcome was location of death for four divided groups (physicians, other health professionals, other higher education, all others). For the total population (over these 30 years), about 40% of people died in a hospital and 72% in any facility (including hospitals. )** Knowing that baseline, and 'knowing' that doctors die differently, what percentages would you guess for physicans? 20% and 50%? 30% and 60%? 38% and 63%? If you guessed the last one you would be right. Compared to all others doctors are less likely to die in a hospital than the 'all others' category (38.3% vs 40.4%, Adj Odds Ratio 1.10). For death in any facility doctors will also be less likely than 'all others' (63.3% vs 72.4%, Adj Odds Ratio 1.34). Now those numbers are statistically significant, but they do not seem to explain the anecdote quite well. One could make up a number of arguments that could support data like this, which would not include doctors choose less aggressive care at the end of life. So after seeing all of this, can we conclude that doctors die differently than everyone else? The statistics are significant, but not really overwhelming. It really isn't a strong enough difference that I would feel compelled to keep the "How Doctors Die" essay as a hallmark of strong differences. Until there is stronger research tying any of this data to the decisions that doctors make, the best I can put my conclusion is: doctors die slightly differently than everyone else, statistically speaking. *Wouldn't similar rationale hold for nurses to also make different choices at the end-of-life? One study looks at it, but lumps nurses in with many other health professions with less exposure at end-of-life. **Those numbers have shifted over time as the 2013 Teno Medicare study showed 25% for Medicare decedents in 2009 died in a hospital. *** Still so many people who die without the support of hospice, it still surprises me. Christian Sinclair, MD, FAAHPM is the editor of Pallimed, president-elect of the American Academy of Hospice and Palliative Medicine, and a palliative care doctor at the University of Kansas Medical Center. “Only a few days,” I said. I was young and beautiful and too green to know that the wise clinician always fudges the prognosis. Within minutes the message was winging its way across the globe. A few nights later and there were relatives tucked in every corner, swinging on the rafters, hanging from the roof, dangling from the curtains. Not that granny was an angel. To paraphrase Jonathan Swift: true to her profit and her pride, she made them weep before she died. But as La Rochefoucauld observed, we are more often loved for our vices than our virtues, and the relatives had ridden in on the four winds, swum dangerous rivers, climbed huge mountains, endured biting insects and even Ryanair flights. They’d come from Boston, Singapore, Sydney, Vladivostok, all determined to be there at granny’s deathbed. So I was disconcerted to find granny looking much better, quite perky even. Breaking bad news is all part of the job, but breaking good news was a novel challenge. I’d parked my car on a downhill slope, facing away from the cottage, to facilitate a quick getaway. If it proved a long pursuit, had I enough petrol, I wondered. There was an ominous silence, which, inexperienced as I was, I felt compelled to fill. “Underneath it all, she has a great engine, heart like a lion, strong as a horse, and all,” I continued, starting to babble, hoping that this testament to the clan’s animal virility might soften the blow. “We were told she was very ill,” accused Boston. A rebellious muttering began. “It’s cost me a bloody fortune,” from the deserts of Sudan. “My return flight is next weekend,” from the gardens of Japan. “I’ve taken a week off work for this,” from Milan. “I knew there was bugger all wrong with her,” from Yucatan. The crowd shifted threateningly forward, as crowds do when someone has a rope, a nearby tree has a convenient low branch, and the gestalt has a lynching in mind. Dr Liam Farrell (@drlfarrell) has been a columnist for many years, for the BMJ and Lancet among others. He was a family doctor for 20 years in Crossmaglen, Ireland, and is a former tutor in palliative care. Follow his Facebook page. 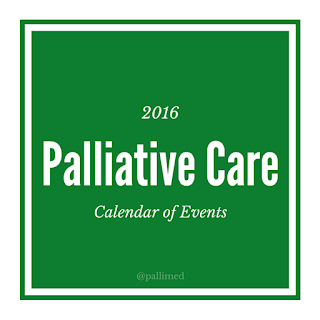 Topic 1: Do cancer patients get more palliative care than elderly multi-disease patients? Why is that? Topic 2: What do patients and families expect of prognosis, especially close to death? Topic 3: How can we help patients and families prepare for death? 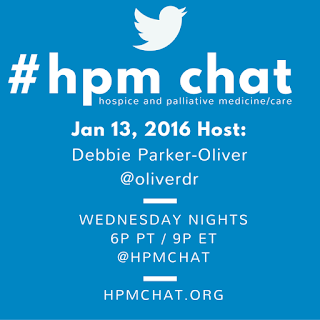 Please follow @hpmchat and check hpmchat.org for more details. You can access the transcripts and analytics of #hpm chats through @Symplur. Last year, Vice President Biden said that with a new moonshot, America can cure cancer. Last month, he worked with this Congress to give scientists at the National Institutes of Health the strongest resources that they’ve had in over a decade. So tonight, I’m announcing a new national effort to get it done. And because he’s gone to the mat for all of us on so many issues over the past 40 years, I’m putting Joe in charge of Mission Control. For the loved ones we’ve all lost, for the families that we can still save, let’s make America the country that cures cancer once and for all. Medical research is critical. 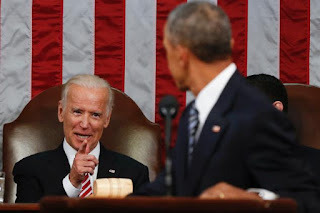 VP Biden first brought up the cure for cancer in a speech late last year when he was announcing his decision not to run for president. You may recall that his son, Beau Biden, died from brain cancer in May 2015. Reflecting on his family's experience, VP Biden discussed his renewed focus on the things he wanted to change. I believe we need a moon shot in this country to cure cancer. It’s personal. But I know we can do this. The president and I have already been working hard on increasing funding for research and development because there are so many breakthroughs just on the horizon in science and medicine, the things that are just about to happen, and we can make them real, with an absolute national commitment to end cancer as we know it today. And I’m going to spend the next 15 months in this office pushing as hard as I can to accomplish this, because I know there are Democrats and Republicans on the Hill who share our passion—our passion to silence this deadly disease. Now we could get into some of the deeper questions, like can cancer ever be cured given the predilection to mutating, the fact that cancer is not one disease it is many, and so on. But let's focus on the fact that many resources will be now laser focused on cancer research and treatment like never before. 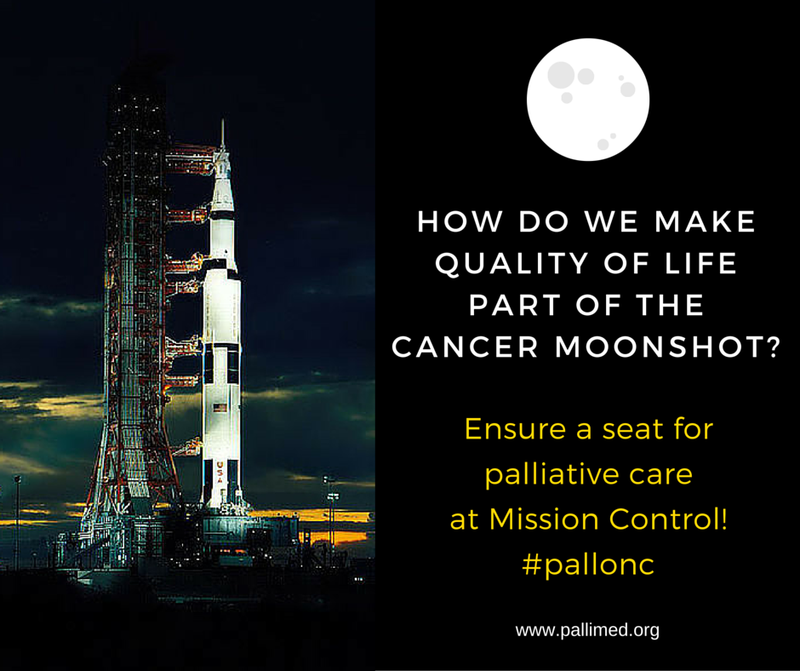 Now that palliative care has become a much more integrated part of modern oncology care (yet we still have a ways to go), how do we make sure that palliative care is at Mission Control with a seat at the table? Shall we start with understanding the Cancer Moonshot beyond the soundbites? Part of the Cancer Moonshot, is related to the NIH's recent $2 billion funding increase, the largest in 12 years (Way to go government! Thank your legislator!). Chances are much of that new research money is already getting earmarked for projects. To boot, the palliative care research infrastructure is still young. We have great organizations like the Palliative Care Research Cooperative Group (PCRC) and the National Palliative Care and Research Center (NPCRC) and a few institutions in the US with the bulk of palliative care researchers. But hopefully through these nascent PC research programs and organizations like the Patient-Centered Outcomes Research Institute (PCORI) we can get more quality of life research projects submitted and approved for grants. Increase resources - both private and public - to fight cancer. Break down silos and bring all cancer fighters together - to work together, share information, and end cancer as we know it. Not many palliative care clinicians I know would brand themselves as 'cancer fighters', so rebranding seems to be a unlikely option, but maybe we can be part of the second option, breaking down silos. We're good at communication, right? Let's partner with our oncologists and researchers so that we can help make palliative care a standard of care for all patients, at any age and any stage. So if you are part of an academic medical center, extend your hand and offer to support and bring a quality-of-life focus to any cancer research. If your research experience is quite small, then consider making sure your organization is a part of PCRC, or talk with your professional organization like AAHPM, NHPCO, or HPNA and let them know this matters to you. And if you use social media, make sure you speak up for quality of life and palliative care inclusion whenever you hear about cancer research or the Cancer Moonshot. Let's make sure quality-of-life is part of the Cancer Moonshot. 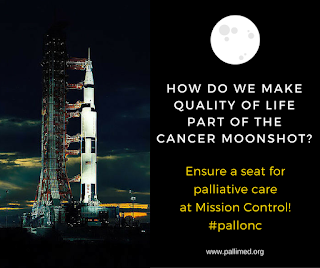 Let's get palliative care at Mission Control. Christian Sinclair, MD, FAAHPM is a palliative medicine doctor at the University of Kansas Medical Center in Kansas City, KS and the editor of Pallimed. by Nrupen Bhavsar, Arif Kamal, Donald H. Taylor, Jr.
13% of the US population is over the age of 65 but account for 30% of all prescription medication. Medicare expenditures for end of life care are approximately $150 billion annually, with much of these costs attributable to medication related to supportive care, comorbid conditions, and disease prevention. 61% of older patients under the care of a physician take at least 1 prescription medication; the majority of these patients are taking 3-5 medications. This excludes over the counter medications. Statins are used in almost 50% of elderly patients. 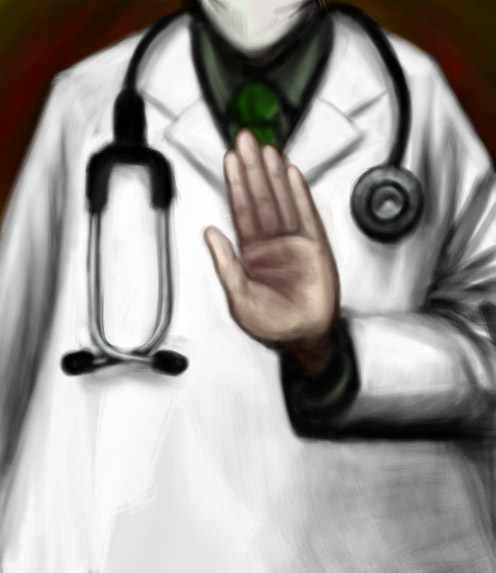 50% of physicians continue statins for primary prevention until patient death. However, recent evidence suggests that “statins” (e.g. atorvastatin, simvastatin; medications used to control LDL cholesterol) may not be appropriate in patients with end-stage non-cardiovascular illness. In the Statin Discontinuation Study, investigators from the Palliative Care Research Cooperative (PCRC) reported no survival decrement and improved quality of life in patients whose statin was discontinued when estimated prognosis was 12 months or less. However, the most recent guidelines update from the American College of Cardiology and American Heart Association (ACC/AHA) expanded the indication for statin therapy to prevent cardiovascular disease to an estimated 13 million additional adults. Importantly, the guidelines did not address the appropriateness in patients who have a limited prognosis but are not receiving active end of life care. Prognosis is not a component of their calculator; it is left to clinician judgment how to manage medications not directly related to an active quality of life issue, like pain or nausea. There is similar uncertainty in the appropriate use of other commonly used medications. Research that investigates the appropriateness of real world medication use in patients with life limiting illness may reduce unnecessary spending while improving the quality of care. We need better information on medication management in patients with limited life expectancy. This week, the American Academy of Hospice and Palliative Medicine (AAHPM) will send a survey to their members on our behalf that aims to understand clinician attitudes and practices regarding counseling patients in palliative care/hospice about medication discontinuation. 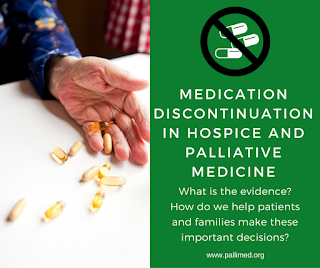 When should we be engaging patients in discussions about medication discontinuation? Is this about a certain prognosis, functional status, or some other estimation of risks from polypharmacy? Are there barriers that prevent discussions about medication discontinuation? Are these related to our own practices, working with other clinicians, or patient/family factors? Whose responsibility is it to manage medications in end of life patients? The palliative care specialist? The primary care provider? The non-palliative care specialists (e.g., cardiologist, nephrologist, etc.)? There are no easy answers to these questions and we welcome a robust discussion about this. We encourage you to complete the survey so we can better understand how best to counsel patients about medication discontinuation. Pallimed Disclaimer on Surveys and Research: Pallimed occasionally publishes opportunities for our readers to participate in research. All surveys are reviewed prior to publication here. We will only do this sporadically. 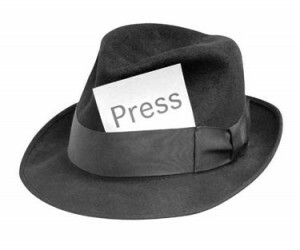 We do not recieve any compensation for publication. If you are interested in collaborating with Pallimed for research, please contact editor@pallimed.org. A reluctant caregiver is a person who is unwillingly in the caregiving role for a hospice patient. There are shades of reluctance that a caregiver might have, and several ways in which caregivers’ feelings may be revealed in the course of hospice staff interaction. It is not uncommon for many caregivers to have periods of reluctant moments. This article is about the caregivers whose feelings of reluctance are their primary emotions. We do not condemn any caregivers for their feelings, but rather identify that reluctant caregivers exist, and suggest ways in which we can navigate care along with these caregivers to provide the best care possible for the patient. There are variations of the reluctant caregiver and these are not mutually exclusive categories. A reluctant caregiver can have multiple reasons why they resent their role. It is important to note that the categories themselves do not make a caregiver reluctant. The Ex: The Ex can be an ex-spouse or even an ex-daughter in law. The Ex could still end up as the primary contact caregiver because Power of Attorney (POA) paperwork was never updated or because the patient never remarried. Patients with this type of reluctant caregiver live in long term care facilities. The "ex" may still maintain financial responsibility for the patient, but might tell hospice team they are not emotionally connected and are only serving in the caregiving role out of a sense of responsibility. The Out of Towner: Typically a child or a sibling, the Out of Towner finds it to be an inconvenience to be pulled in to hospice decision-making. It is important to note there are family members who happen to live out of town who are highly engaged. The Out of Town reluctant caregiver would be the one who repeatedly expresses irritation or inconvenience related to being in a different city. If they do come into town to visit, they will convey that they come out of a sense of responsibility, rather than a desire to be with the patient. Semi-Estranged: The Semi-Estranged caregiver is one who had not had close contact with the patient prior to the hospice admission, but is now compelled to be more involved due to patient’s declining condition. The semi-estranged may reveal past hurts with patient and often openly expresses resentment. Obligated: The Obligated reluctant caregiver is a caregiver who is the obvious choice, but not necessarily the most willing. It is the spouse who is still married to the patient despite a history of abuse. The Obligated reluctant caregiver might be the one child of many that was designated POA, perhaps a last living relative, or an only child. Overworked: The Overworked caregiver is one who expresses frustration with multiple situations pulling their attention. It could be a caregiver who has a busy job or the adult child of a patient with multiple responsibilities of family or other people who need care. At hospice admission, it may not be clear to the hospice team that they have a reluctant caregiver. Prior to admission, families often overestimate the amount of personal care support that will be provided by the hospice team. This can be compounded if there is misinformation given by friends or non-hospice health care providers. Reluctant caregivers are initially enthusiastic for hospice because they believe hospice will come in and take over so they do not have to do personal care. The reluctant caregiver will be the first one to express dismay that hospice aides are not there “more.” Often, because reluctant caregivers can be very vocal with their distress, they can be persuasive with hospice teams that aim to please. Caregivers’ feelings of reluctance are soon revealed either directly or indirectly. Directly, a caregiver may express discontent and frustration with outside caregiving support. They may complain about putting their own life on hold. The hospice social worker may hear about relationship issues the caregiver has had with the patient in the past. 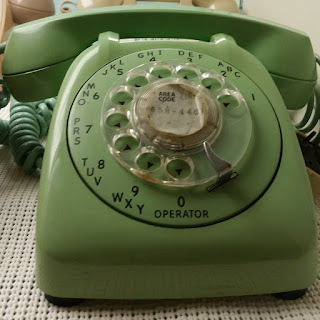 Have you been waiting a while for the return phone call? The passive, indirect expression of reluctance is potentially the biggest challenge to the hospice team. It may be as simple as the caregiver not returning phone calls from hospice staff. On a more serious note, hospice staff may find the personal care provided to the patient at home is less than ideal. The caregiver may leave a bedbound patient alone for extended periods of time. The hospice team may find the patient’s Depends have not been changed for twelve hours. The caregiver may be verbally abusive towards patient. Often these situations turn into discussion in IDT meetings regarding the quality of care. We might discuss, "How bad does it need to be before hospice needs to report the family to Adult Protective Services (APS)?" • Is the "neglect" due to lack of ability or lack of desire? • Is this a short-term situation that a caregiver respite would alleviate? • Has the social worker spoke with the caregiver about community resources? • Has the hospice nurse set expectations and/or provided education regarding patient personal care needs? *A side-note on the last question. The biggest challenge for me on this topic is the patient with a neglectful reluctant caregiver who doesn't qualify for aid, and yet doesn't want to spend money for private pay care. More often than not, these are adult children with a semi-estranged relationship with the parent. These are the caregivers who do not answer the phone or do not return telephone calls. The Lamenting or Estranged caregiver is usually the most vocal about their reluctance. These caregivers who seem to be the most receptive to psychosocial support when they are open about their emotional anguish. • Staff should listen and offer support but do not get caught up trying to fix or resolve situation. The number of reluctant caregivers is likely to increase as the Baby Boomer population ages. • More and more families are geographically separated. • Modern American life is composed of blended families. • The multi-generational family focus is rare. • Caregivers are often aging themselves and have their own health issues. To provide the best care possible to the patient and family, we will need to continue to explore ways in which we can support our patients with these reluctant caregivers. Hospice payment reform has arrived. A recent study by Joan Teno and Michael Plotzke presented to CMS found an alarming number of patients were not getting hospice visits in the final days of life. Likewise, a recent study out of the University of Buffalo looked at the experiences of EMTs handling death and dying calls, many of which were with hospice patients. Both of these studies cause us to wonder where the hospice staff visits were during these very difficult days/hours. Why didn’t family call them rather than the EMTs? 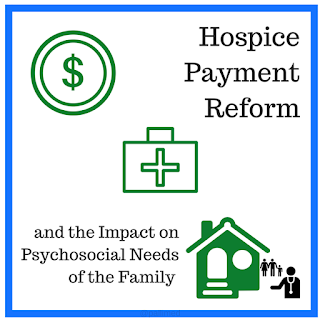 The goal of payment reform is to provide the resources necessary for hospice patients and families to receive additional nursing and social services in the final days of life. In theory it sounds like the answer to the problem, pay them and they will be there. But money may not be the only problem. 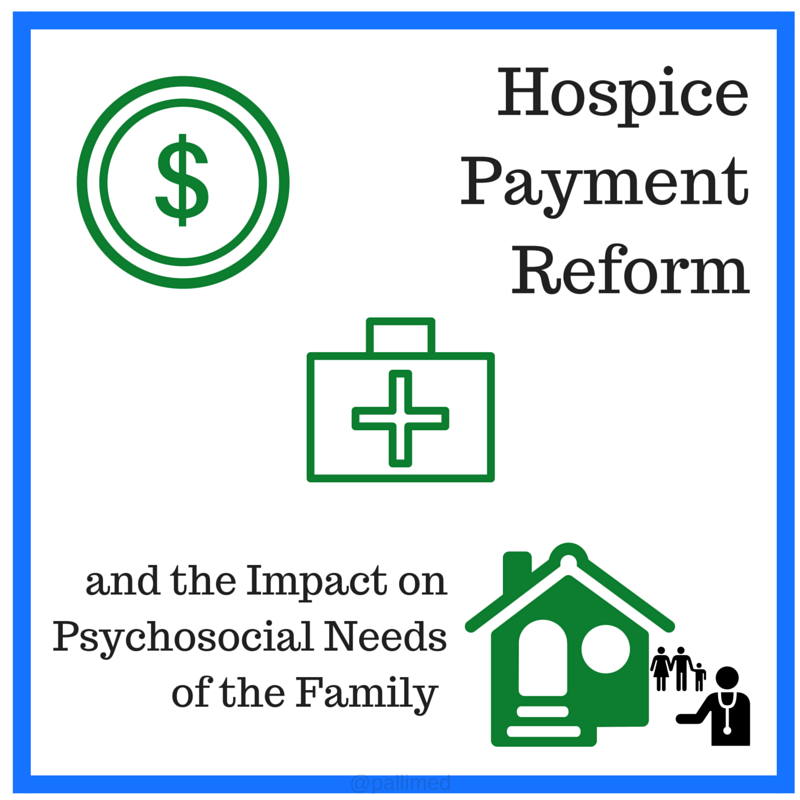 While providing additional resources, these reforms challenge hospice programs in many ways. Not to be taken lightly is the expectation that the hospice staff will know when the final days are here. Prognostication is both an art and a science and the ability to guess if this is the time is not easy. Staffing is yet another challenge as some programs implement standard visit schedules (2x per week). The new payment model is one that best fits flexible visit schedules, with the timing and frequency of visits determined by patient need. Yet another issue is “what to do” in those final days or hours, especially if things are “as good as they can be”. While staff experience deaths of hospice patients perhaps hundreds of times per year, family members, caring for their loved one, will most likely experience this once in a lifetime. Walking the journey toward death in those final days is a difficult one, often with changes in symptoms, cognitive status, and personality. These changes, normal and expected to hospice professionals, are not normal to a family. The traditional answer to family questions regarding these unexplained and troubling events may be, “its part of the dying process”, yet this explanation does not soften the emotion experienced by the family. 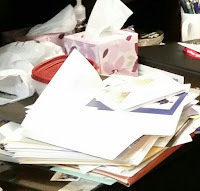 Most hospice programs provide family with a handout of some form that is to prepare them for what dying might look like, yet when it is actually near, the handout may not tell them what to do, nor help them cope with what they are experiencing. The terrible sound of agonal breathing or a death rattle, the anxiety associated with oxygen deprivation, the confusion with sudden drastic changes in pain medication, or the frustration with the incontinence are terrifying for family and produce great anxiety. Assurances that the patient is not suffering, or the validation to administer greater and greater amounts of narcotics, does not always give the family comfort. Fear that your loved one is suffering, or fear that you killed them with the final dose of morphine can have lasting effects into bereavement. The final days and hours of caregiving will be relived over and over again by family as they learn to deal with the reality of bereavement and carry the burden of guilt, regardless if they actually are guilty of doing anything “wrong”. Fear can lead to panic, and panic can lead to calling an ambulance whose response is minute rather than a hospice nurse who may take an hour or more to respond. Hospice payment reform will only address the issue if it leads hospice programs to examine their care during those final days. Providing education on the expected physical symptoms, waiting for family to call when they need something, or using the standard phrase, “it’s a part of the dying process” will not change the outcomes. Preparing family members not only with what to expect but also with things they can do can provide control and reduce fear. Telling them when to call is more helpful than expecting them decide if something is worth calling about, especially at 2am. Validating the emotions that come with caring for someone you love during this difficult time, and teaching family how and when to say goodbye are all helpful necessary interventions. Working with family to proactively create plans for how care will be delivered and who may be available to assist in those final days is critical. A proactive approach by the hospice team that includes not only increased visits, but also phone calls, and expanded education and coping strategies may be the key. Perhaps an ignored part of most quality assurance plans, perhaps payment reform will provide incentive to think outside the box and create interventions for improvement. What are ways we can prepare hospice family members for the final days/hours of caregiving? What are the most troubling symptoms in the final hours for hospice staff to manage? How are hospices preparing for payment reform to allow them to be more present in the final days/hours? 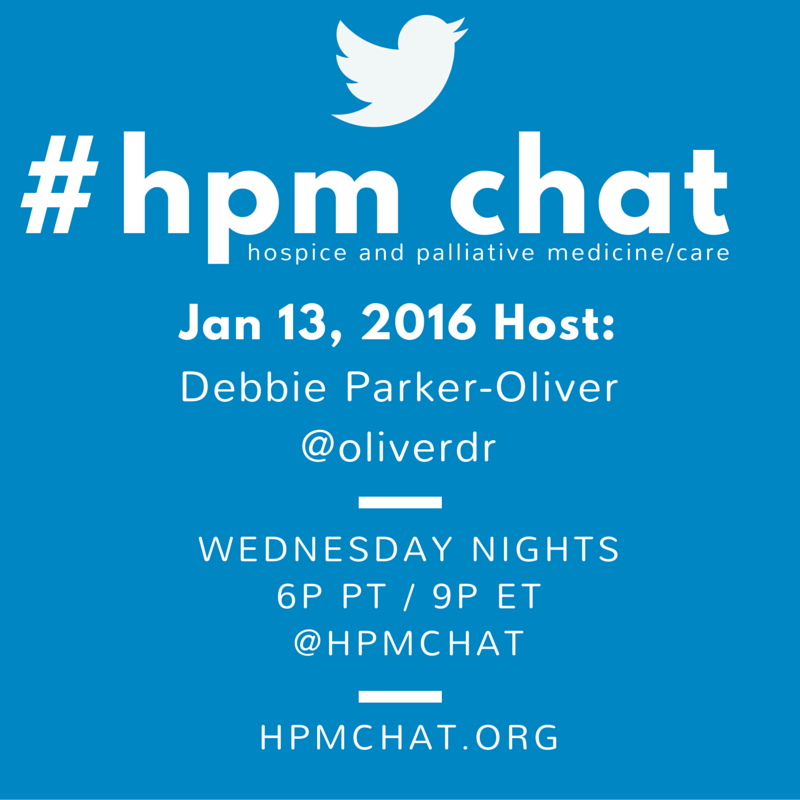 Follow @hpmchat for up to date info. 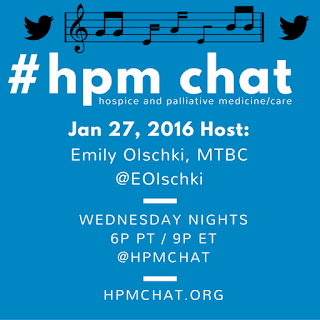 You can find past #hpm chat transcripts and analytics on Symplur. 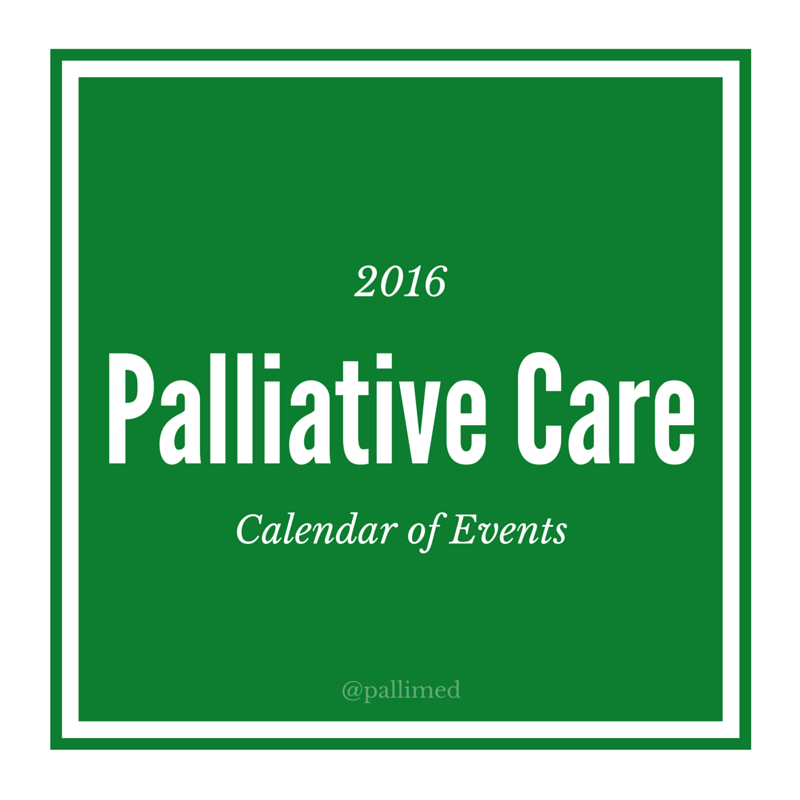 2015 was a pretty exciting year in palliative care, but 2016 has a lot happening as well. Here are some of the things to put on your calendar right now, so you do not miss them! To access these dates via Google Calendar (HTML), click here. To import a .ics file of all current dates to your calendar software, click here. If you know of any other major events, please add them in the comments below and we may add them to this growing list. If you would like to help maintain this list and the Google Calendar, it is pretty easy, and can be taught in less than 30 minutes, please email editor - at- pallimed.org. If you are interested in writing up a report for a major conference listed above, we are always looking for traveling correspondents. Please read this overview of writing conference reports and submit the form on that page. 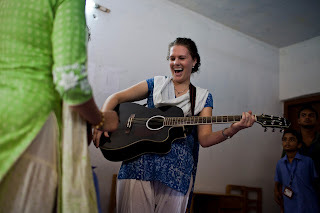 If you are interested in educational events in Asian countries, please see this Google Calendar maintained by APHN. Christian Sinclair, MD, FAAHPM is the editor of Pallimed, and always loves a good conference. Since it is impossible for someone to get to every conference, we try and make sure that the high points and unique aspects of key conferences in hospice and palliative care get some coverage. If you happen to be attending one of these conferences and are interested in contributing to our conference coverage, we would like to share a little bit more about the process and hope you will considering signing up to write a review. We hope you are willing to share what you learned with at least your colleagues who stayed home to cover work while you attended. And if you are going to share information with them, why not polish it a bit more and share Posts on Pallimed have the potential to reach tens of thousands of people based on our reach on various social media platforms. You can make an impact with just a little bit of effort. First, we are primarily looking for writers who are also clinicians in hospice or palliative care. This site is primarily written by clinicians for clinicians, and that is the majority of our audience. Patients, caregivers and advocates are also welcome to submit as we value their unique perspective. If you are directly involved with the conference, we ask that you work to find another attendee to help ensure a more neutral tone. Second, please go read some of our other conference reviews to get an idea of what we are looking for (length, tone, points covered, etc.). Your review doesn't have to follow the same format, but it might help give you an idea of what works best. Third, you do not have to be a natural writer. Our editors will help craft your writing if you have any major concerns. We hope you are interested! If so, please fill out the form below! Christian Sinclair, MD, FAAHPM is the editor of Pallimed and a palliative care physician in Kansas City.